The German e-MTB brand unveiled its full 2016 line during show season — 51 models in the U.S., up from 15 the year before — but Haibike USA has a fresh plan to help American retailers move all those bikes out of their front door. In February, Haibike reps will begin visiting shops with a new tablet-based SalesCenter tool to educate shop owners and staff on sales techniques, e-bike technology and other information to help them become expert e-MTB sellers. Haibike will also have the tool available at Sea Otter in April. Eventually, Haibike hopes to put SalesCenter into retailers' hands on their own devices. “This is something we want to offer our retailers as Haibike dealers,” said Ken Miner, director of sales for Haibike USA. Meanwhile, the company's U.S. territory managers are reaching out to land managers in their regions to determine where e-mountain bikes can legally be ridden — information that will be passed along to Haibike dealers who may not know, for instance, that you can ride an e-MTB on Moab's Slickrock Trail, Miner noted. Under new ownership — and also marking its 25th anniversary — Ellsworth came to PressCamp with its fully redesigned 2016 line of Instant Center Tracking (ICT) full-suspension carbon and aluminum mountain bikes with numerous updates and eye-catching finishes. The brand's Epiphany platform now extends over six models — aluminum and carbon, each in 29er, 27.5-inch and 27.5-plus wheel sizes. The 27.5-plus models are compatible with 29-inch wheels, but the 29er versions are not plus-compatible. Rear travel ranges from 120 to 140 millimeters, depending on model. To improve rear-end stiffness, the Epiphany now has Boost hub spacing and Ellsworth's new monocoque Carbon Torsion Arch bridging the seatstays. The new Hex Taper Axle has a hexagonal shape on both ends to lock into the dropouts and enhance stiffness, and redesigned rocker arms — half the length of previous Epiphany rockers — pivot on two sets of custom-made Torque Tube bearings. Also new is the Rock Locker shock pivot pin, which effectively locks the rockers together for additional stiffness. The full-suspension line also includes the new G-series carbon frame, with a three-position shock shuttle to fit different-length shocks to deliver 160, 180 or 200 millimeters of travel. The 160-millimeter iteration will be dubbed Moment, Ellsworth's longtime trail/all-mountain model, while the 180- and 200-millimeter bikes will carry Ellsworth's DH model name, Dare. All G-series bikes are 1-by only. For 2016, the carbon suspension frames will be available in candy finishes — red, blue and black — inspired by hot rods. Founder Tony Ellsworth said he experimented with the finish extensively before coming up with a four-stage process that delivers a deep hue but still lets the frame's carbon weave come through. Belgium's Ridley is looking to make it more affordable for road cyclists and triathletes to slice through the wind this year with new lower-priced versions of its aero and TT platforms — the Noah and Dean, respectively. The new Noah comes from the same mold as Ridley's higher-priced Noah SL model, but gets a different carbon layup and a traditional bladed aero fork rather than the SL's heavier split fork. With that weight savings, the full Noah frameset weights in on par with the SL, plus the rider gets a more compliant ride, said Cristobal Viveros, sales and operations manager for Ridley USA. Total weight for the Noah is about 15 pounds with an Ultegra mechanical build (MSRP: $3,750). The Noah is also available outfitted with a 105 mix build ($3,000) and in Ultegra Di2 ($4,620). The new Dean carries over some of the technology from Ridley's top-end Dean Fast tri/TT platform, such as a zero-offset aero seatpost with the same range of adjustability as the Fast. The frame shapes are almost identical except for the headtube, as the Fast model accommodates an integrated front brake and the Noah uses a conventional front caliper. The change in shape also allows the Noah to utilize mechanical shifting — the Noah Fast frame works only with electronic drivetrains due to the extreme bends cables would have to take inside the frame, Viveros said. Like with the Noah models, the lower-priced Dean does not get the Fast's split fork. And the Dean's aero fork comes with a generous amount of steerer for all levels of athletes to dial in their desired riding position. While the Dean models come spec'd with 25c tires, riders preferring 23s can move the rear wheel closer to the seat tube with the frame's exchangeable dropouts. All models come with Profile Design cockpits for easy parts swaps and availability at a broad range of bike shops. Wheels intended for training are spec'd, based on the assumption that triathletes and time trialists will have their own preferred sets of race wheels, Viveros said. The new Dean comes in three builds: Shimano 105 with alloy Profile cockpit (MSRP: $3,000); Shimano Ultegra with carbon Profile cockpit ($3,750); and Ultegra Di2 with carbon Profile cockpit ($5,500). Ellsworth's Epiphany platform will come in carbon and alloy versions for 29er, 27.5-inch and 27.5-plus wheels. The new G-series frame — used for Ellsworth's Moment (pictured) and Dare models — accepts different shock lengths to deliver 160, 180 or 200 millimeters of travel. The candy finish on Ellsworth's 2016 carbon frames allows the beauty of the carbon weave to shine through. 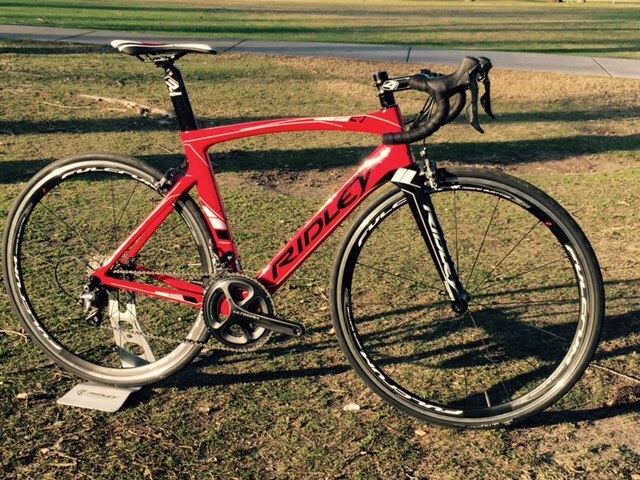 Ridley's new value-priced Noah aero road bike comes in three build levels ranging from $3,000 to $4,620. The 2016 Dean tri/TT bike carries over much of the technology from Ridley's higher-priced Dean Fast model. The Dean's components include Profile cockpits and a toptube bento box.